Have I mentioned that many of my friends have the audacity to move away? In spite of that, I’ve had the good fortune of getting to combine work travel with friend visits over the past few years. I certainly won’t complain about the travel, but I will say that traveling for work is not quite as glamorous as expected when I was a bright-eyed college student looking for jobs. It’s great to get out of the office, but meetings, rental cars, and fast food aren’t the stuff of which dreams are made. But it’s such a blessing when I get to visit friends in a city where I’m going for work! That’s what happened a few weeks ago when I made a stop in Dallas for the book tour we’ve been working on. Trevor and Sarah are among my favorite people, and I adore their three little girls. We worked together for several years when they lived in Orlando, and they were my piano teachers for a while. You can read a little more about that glorious scenario here, where our friend Jennifer and I would take over food on Tuesdays in exchange for learning piano. It was a beautiful arrangement all around. Jennifer and her husband, Cheddy, just moved south Asia. See a pattern here? A few years ago Trevor and Sarah and their girls moved to Dallas, and I’ve been lucky to see them a few times since then. I was thrilled that the trip back in March worked out, because they’re preparing to move to Brazil this summer. (Story of my life…) Between the schedule of meetings, speaking events with my authors, a radio interview, an evening with donors, church on Sunday and flying out shortly after that, I had an all-too-brief window on Saturday morning for some good quality time. We checked out the website and read all about the barn maze, petting zoo (for the girls, of course), cowboy shoot-out show, a museum, and several other things that sounded like they were just a step above a tourist trap. Nevertheless, the prospects of taking in Texas-sized culture with one of my favorite families and seeing livestock surpassed any reservations we might have had. And we needed to get there before 11am so we could watch the cattle drive. THERE WAS A CATTLE DRIVE?!?! I was more excited than Annie Oakley after winning a shoot out. The cattle drive elicited grand visions of cowboys and ropers leading a stampede of Texas Longhorns down the avenue and into the stockyards, the earth rumbling beneath the weight of clamoring hoofs. I was even willing to take a flesh wound from a passing steer if it would have made a good story. The actual “cattle drive” wasn’t quite like that. We walked up and down the street to see the sights after the cattle meander (since I really can’t call it a “drive” with a clean conscience). The Stockyards was a great way to spend the morning, even if the main attraction was a little less exciting than I had built it up in my head. While we decided to pass on the maze and the petting zoo, we had a great time seeing a little slice of Texas culture. We finished the day with a stop at In-n-Out Burger and the world’s most epic and disappointing search for donuts, but that story will have to wait. What about you? What’s the most exciting “touristy” thing you’ve done recently? What’s your go-to recommendation from a place you’ve visited or a place you lived? P.S.–Most of the “Weekends are for Wandering” post will be from central Florida, but I included this one in case you ever make it to the Dallas/Fort Worth area. The Stockyards are a lot of fun, and there’s plenty to do if you’re up for it. If you and I ever get to hang out on a Saturday morning, it’s likely that I’ll try to get you to the Winter Park Farmer’s Market. It’s one of the best farmer’s markets around, and it’s worth the drive from anywhere you might be coming from in the Orlando area. While I’ve visited the market several times over the past four years, a friend and I decided to meet up for a little wandering a few Saturdays ago. There’s no shortage of flowers, plants, and people-watching to enjoy. There are countless vendors, and all of them are consistently pleasant and helpful. Local honey. Fresh flowers. Artisan olive oils. Dried fruits and vegetables. Plants. Bagel sandwiches. Coffee. Cheeses. Homemade breads. Kettle corn. Cupcakes. And a random barbecue stand that’s surprisingly busy before 10am. It’s all there for your viewing (and purchasing) pleasure. And what a pleasure it is. While i don’t make it to the market consistently, I usually purchase vegetables for the upcoming week (along with the occasional pastry and coffee). The quality is always excellent, and prices are better or comparable to the grocery store. Add that to the benefit of supporting local growers, and you have the makings of a great morning excursion. I love that people often bring their dogs to the market. There are even a few vendors specifically for pets. And one of my favorite things to get is a homemade Arnold Palmer from the couple that owns the lemonade stand. Fresh-squeezed lemonade and iced tea is proof that God loves us and wants us to be happy. If you live in the Orlando area and haven’t yet made it out to the market, you’ll want to make this a priority soon, especially before it gets too hot during the summer. The farmer’s market is open year-round on Saturdays at the train depot in Winter Park, Fla. You can find out more at the City of Winter Park website. If crowds aren’t your thing, be sure to get there on the earlier side, by 9:30 or so. There will still be a crowd, but it doesn’t seem to get really busy until the 10am or 11am hours. When you’re done, take a stroll up Park Avenue past some of the great shops and restaurants, or sit in the park and watch the trains and the people go by. It’s seriously one of my favorite ways to spend a Saturday morning. 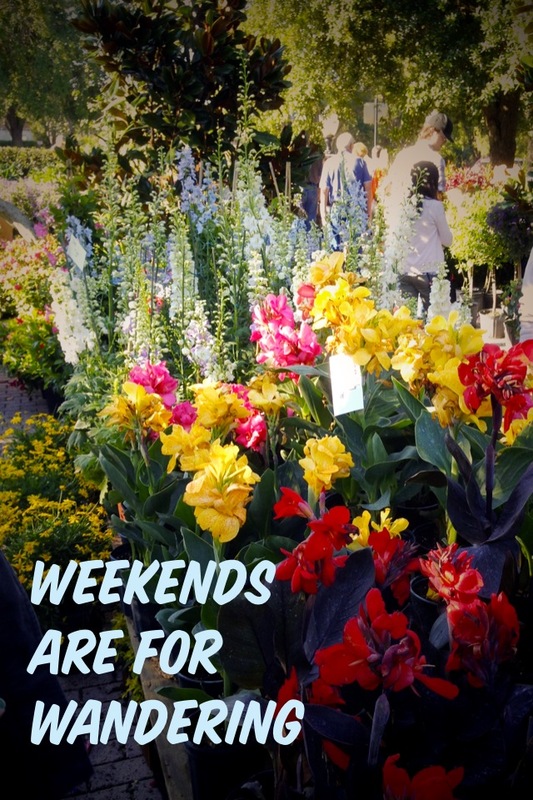 P.S.–“Weekends are for wandering” is a new category/blog series I’m working on about fun and affordable things to do primarily, though not exclusively, on the weekends. 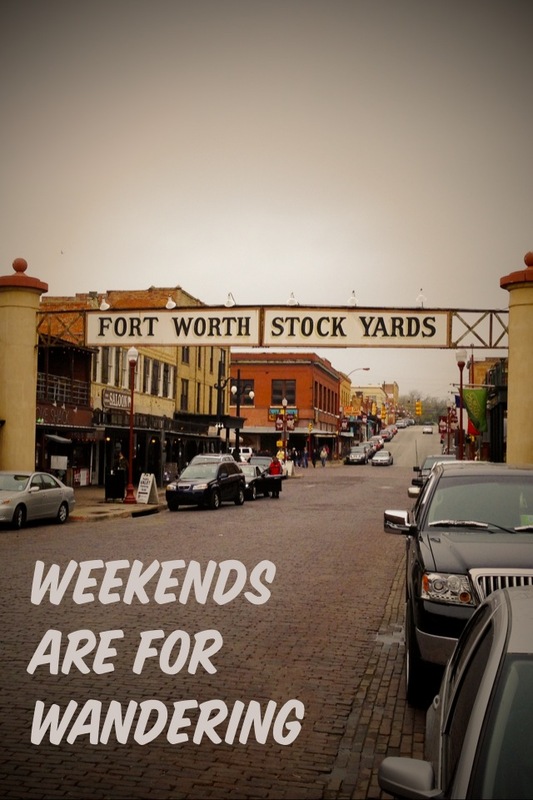 Most of the activities will be in Orlando and around central Florida, but you may see a few other places mentioned, like the Fort Worth Stock Yards in Texas that I was able to visit back in March. Stay tuned, and happy wandering!